Are you satisfied with the feedback you got so far from fans and press for “Shadows of Blue” album? Yes, I get strong reactions for the track “To Love You”. Why you decided to record “Shadows of Blue” album in Nashville? Can you tell us a few words about your musical roots? 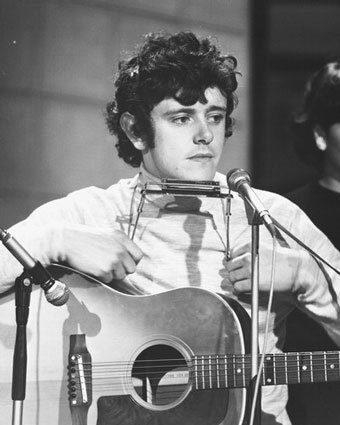 I never forgot Nashville and I knew I would go back to Nashville (ed: Donovan recorded his first single “Catch The Wind” in Nashville in 1965) one day with a set of songs I have kept in my back jeans pocket. As a kid in 1940’s Scotland I listened to my Irish-Scots family singing folk songs, though I didn’t know they were folk-songs then. Songs of oppression and rebellion, prison ships and forced migration, laments of lost love. My father would recite the poems of Robert Service, tales of The Yukon and the adventurers who went over to America in the 1800’s, taking the Irish-Scots music with them. Many settled in the rural south and helped create Country Music. As a teen I listened to Hank Williams, Buddy Holly and The Everly Brothers and I knew I wanted to sing and make records. I hitch-hiked away from home at 16 with my pal Gypsy Dave (ed: Mills; sculptor, songwriter and Donovan’s tour manager) and a borrowed archtop Zenith guitar. I slept on the beaches of Cornwall and seriously learned Mother Maybelle’s finger -style guitar picking which became such an important part of my recordings. It was my great good fortune to be discovered in London at 18 and recorded by Ralph Peer Jr whose father Ralph Peer had recorded The Carter Family and Jimmy Rodgers in 1928. Every time you release a new album people tend to compare it with your classic ones. Does it seem unfair to your newer music? This is quite common with all works of art from creatives that experience great fame when young. With me it’s hard to compare as so many different sounds are attracted to my poetry, each becoming the soundtrack to the aural landscape I see/hear inside me at the time. 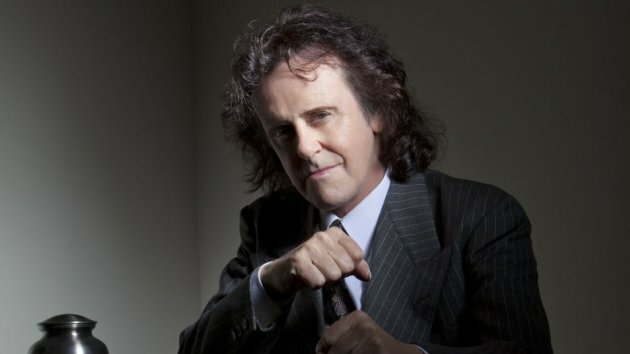 How important was the contribution of Mickie Most (legendary producer of Donovan and The Animals) to your career? I had 4 hit records before I met Mickie and then Mickie was a wizard at picking songs for our 14 Top-20 singles and he saw I was hearing a fusion of many sounds and styles, and he encouraged my innovation. 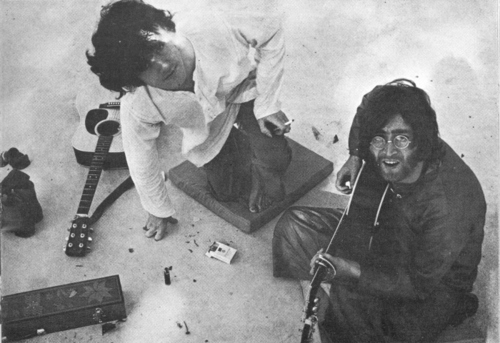 In 1968 Mickie said: “Donovan and I were ahead of The Beatles, we were Flower Power in 1965. We would do something and The Beatles would copy it”. 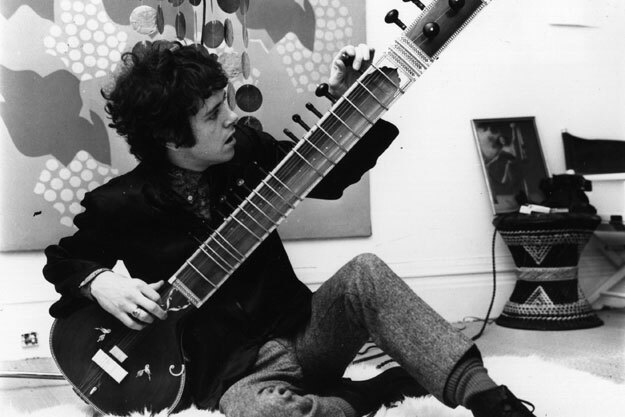 “Sunshine Superman” (1966) is the first British psychedelic folk album ever released! Had you realised how revolutionary it was when you released it? It was the first Psychedelic Album in the world. Yes, we did know what we had made. But I was sued by a label and the album sat in court for 6 months. Mickie said: “Don’t play this to McCartney”, but I did. I wanted to show off to Paul what I had achieved. Why was Jimi Hendrix your first choice for “Hurdy Gurdy Man” single? I was the first to welcome Jimi when he was flown into London in ‘67, by his manager and producer Chas Chandler of The Animals. My pal Gypsy picked up Jimi from the airport. Then Chas set up the first Jimi performance in The Bag O’ Nails club and invited every important artist in London, including Beck, Page and Clapton. Jimi blew us all away. I wanted to give “Hurdy Gurdy Man” to Jimi but Mickie said it was my next single. We asked Jimi to play but he was working one night stands. Is it true that Jimmy Page and John Paul Jones were so satisfied with their performance in “Hurdy Gurdy Man” single, that they decided to start a new version of The Yardbirds (The New Yardbirds or …Led Zeppelin)? John Paul arranged and played bass on “Hurdy Gurdy Man” and went on to arrange the music for Led Zeppelin. So, this seems to make sense, that what I created on “Hurdy Gurdy Man”, acoustic guitar, poetry plus power guitar, did in fact inspire Led Zeppelin in their recordings. But Page did not play guitar, Allan Holdsworth of Blue Mink we think played (ed: There is some controversy about who actually played on “Hurdy Gurdy Man” single. Holdsworth didn’t play in Blue Mink, Alan Parker did. John Paul Jones says that Parker played on “Hurdy Gurdy Man” and many sources say that Page played, including his website). Rick Rubin produced your album “Sutras” in 1996. Was Rick Rubin an easy-going person to work with? Yes, spoke very little, loved the ‘60s way of recording, knows a good song, a master and a T M (Transcendental Meditation) meditator like me. You wrote “Writer in the Sun” (from “Mellow Yellow” album -1967) in Greece. Where in particular did you write it and what influenced you to compose it? “Sunshine Superman” continued to run into legal problems as Allen Klein (ed: famous manager and The Beatles manager after the death of Brian Epstein) tore up the deal I had with Pye Records. As a result I was sued by Pye and there was no possibility of release soon. It seemed that my innovative work was to be shelved indefinitely and, that with the bust, it looked like my career was over. I told George about my problems. “The illusion is very strong,” he said mournfully. Gyp and I decided we should just leave the whole game, go back to our travels. I had left home to find freedom, and now that I was losing my freedom I felt I would have to leave fame behind to find it again. “Where shall we go, man?” asked Gyp. “World’s our oyster”, I replied. “Greece sounds like it to me.” “Yeah, man”, Gyp agreed. Ever since I had taken Linda (ed: Lawrence; Donovan’s wife and muse for more than 45 years) to see the film “Zorba the Greek” in St Ives the previous year, I had fancied Greece. And so I asked Anita, who was a full-blooded Greek, to set me and Gypsy up for a visit. Meanwhile I wrote a poem and sent it to Linda, to try to persuade her to come with us. I’d heard she’d come back to England to see Julian (ed: Linda’s son with Brian Jones of The Rolling Stones). She was feeling disillusioned about LA. She loved the sun, but hey, how many tans can one girl get? a little sweat in your palm dry your hand on my hair if I shut my eyes I can Wrap you in turquoise silk. I packed a huge trunk full of books, then down to Granny Takes a Trip for a white sharkskin suit and a panama hat. The bootmaker Lobbs of St James had already become me cobbler and I now sported a pair of two-tone canvas shoes. I think I got me movies mixed up a bit -inside I felt like Alan Bates (ed: who plays in “Zorba The Greek”), but on the outside I looked more like Bob Mitchum in Macao. So Gypsy and I were on the road again, but this time First Class train down to Brindisi, Italy, there to catch the ferry over to Greece. Soon we were pulling through the dark, silent countryside past tiny stations with hurricane lamps burning on the platforms. We went down to Piraeus harbour where Anita asked a shipping clerk for the most unspoiled island in the Cyclades and we boarded an old tramp steamer headed for the island of Pàros in the Cyclades. It was morning when we arrived and disembarked onto the quay with our trunks. Anita asked for a hotel. There was no hotel. “How about rooms then?” There were no rooms to be had. Our guide had an old house and he would let us rent it. Our guide led the way up a road packed with rocks, cleared from the fields of this arid island, the animals expertly picking their way slowly up to the empty house standing on its own, its nearest neighbour some way below. It was perfect, a large flat-roofed dwelling. Wooden shutters opened to the valley below and a panoramic view of the island. There was a nice little veranda with a low wall. A clutch of scraggly chickens lived in the barn and a small outhouse served as a toilet with a hole in the ground. We returned for our stuff, stopping off at a hardware store in the whitewashed town to buy supplies. We would need mattresses, a hurricane lamp, teapot and kitchen utensils, not forgetting a large flagon of wine in a tall, woven basket as well as goat’s cheese, tomatoes and batteries for the portable briefcase cassette deck and record player, the first of its kind from Japan. Soon we had the place in some kind of order, had our first meal and a glass of wine. I had already fallen in love with Greece. The next day, Anita fixed us up with a donkey named Serafina that had one good eye and, on its back, a rough wooden saddle with a worn, padded seat. Photographs show that at first we posed in our city-slicker clothes, squinting in the bright sunlight, with white skin and nice clean shoes. Soon the pictures tell a different story as we bought Greek shirts and waistcoats, sun hats and sandals, relaxing into the slow pace of the islands. I badly wanted my work released in the UK but the machinations of the business world in London had worn me down. 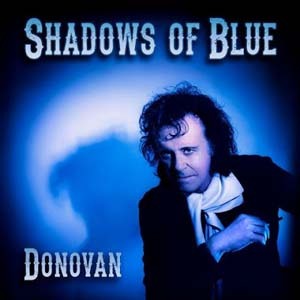 Time was passing, and the “Now Music” of Donovan would soon become the “Then Music”. I also missed Linda terribly. I was lonely and hung out with a couple of girls down on holiday. One morning Gypsy and I woke up to see a basket of figs in vine leaves sitting on the low wall of the patio. We ate the delicious purple fruit and wondered who had left them. The next morning the figs were there again. We saw our neighbour below us; he waved and we knew the figs were his gift to us. He was a silver-haired gentleman who lived in the farmstead close by. He lived alone in a tidy little farm below and rode an immaculate mule. He himself was always very cleanly dressed in simple clothes. Neat hair and aristocratic bearing. Baba Costa was his name. He sat with us in the evening while I played my songs. Neither of us knew the other’s language, but with smiles and miming Gyp and I communicated to him that we really loved the island. We would marvel at the sunset and he would nod, his eyes knowing. He had seen thousands of sunsets up here on the mountain. the retired writer in the sun. One day I was searching the landscape for birds through the small pair of pearl opera glasses I had brought from London, and the old man was evidently curious. I handed him the Edwardian glasses and he looked into the lens. He started back, surprised to see his little house so close. Was it possible he had not used a lens before? Was he kidding? Many Greeks go to sea and he would surely have seen binoculars before. But then, maybe not, from the way he carried on, so pleased did he seem with the discovery. On one of our trips to town with Serafina, Gyp and I were jeered at by some less friendly villagers (our long hair, perhaps). Just then the old man came into view on his mule. He stopped to greet us and the town saw that he had done so. From that day forth we were never treated in an unfriendly fashion. The summer glided on through glorious days and star-filled nights. Gyp and I would take turns riding Serafina down each day to the little taverna on the seafront. “My record is number one everywhere and we have to get to Athens on the next steamer”. The taverna’s owner laughed, not quite believing. We emptied our pockets of coins onto his table. Number one all over the world and not enough money between us to get back to Athens on the weekly steamer due in a few days. “You boys are broke?” the Greek islander asked. “Listen, guys, I have an idea”, the taverna’s owner said. “That briefcase record player you got –I’ll give you the steamer fare for it. That will get you to Athens, at least”. Gyp and I toasted our luck with a few retsinas that day, rolled a few joints and sussed a change. The deal was done. Gyp and I wandered up the mountain to our little house in the sky to pack. We embraced the old gentleman. I gave him the Edwardian opera glasses, which made his face light up. The ferry pulled away from the harbour, and we saw him slowly waving, “Adio, adio, adio”, he said. It was a great change in life when I stepped onto the steamer to Piraeus that summer. Never again would I be as free. But the world lay at my feet. My music was playing on every radio on the green rolling Earth. There was no going back. I strode into a glowing future and embraced fame and fortune, but not without one last melancholy look back at the old man of Pàros, who smiled and slowly waved goodbye. And I also waved, as I bid a sad farewell to a way of life I would never live again. I took one more languorous look at the boy who was fading away. 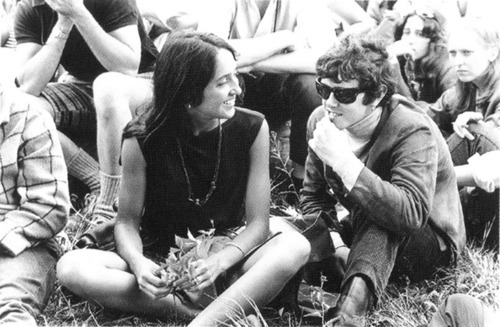 You performed your song “Colours” live with Joan Baez at the 1965 Newport Folk Festival. How did you feel playing this song there with Joan Baez? To be introduced by Pete Seeger at Newport was the acceptance of all I worked towards, to be a voice for freedom and peace. Joaney had made it happen and she also recorded my songs. Singing with Joaney at Newport was an amazing performance and I thank them both. Do you have fun recording “Barabajagal (Love is Hot)” with The Jeff Beck Group? A most interesting and again innovative single we made with Jeff and the band. Mickie said he had not sent any demo to Jeff or the band so they would hear the song for the first time when they arrived in the studio, to keep it fresh and a surprise. It took 2 or 3 takes and it was done. What fun! Do you have happy memories of your travel to India with The Beatles in 1968? 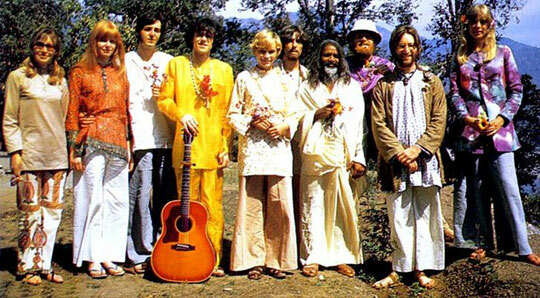 We were seeking a Guru before we met Maharishi, then off to India with our acoustic guitars. Great changes lay in store as we “fathomed the infinite” deep within, with the pure Transcendental Meditation Maharishi give to us. Did you help John Lennon during the writing of “Julia”? Yes, I think some lyrics and of course the finger style guitar and chords that descend.. Dear John was wanting to write of a childhood with his Mom that he didn’t have. Are you proud of your influence on “White Album” by The Beatles? 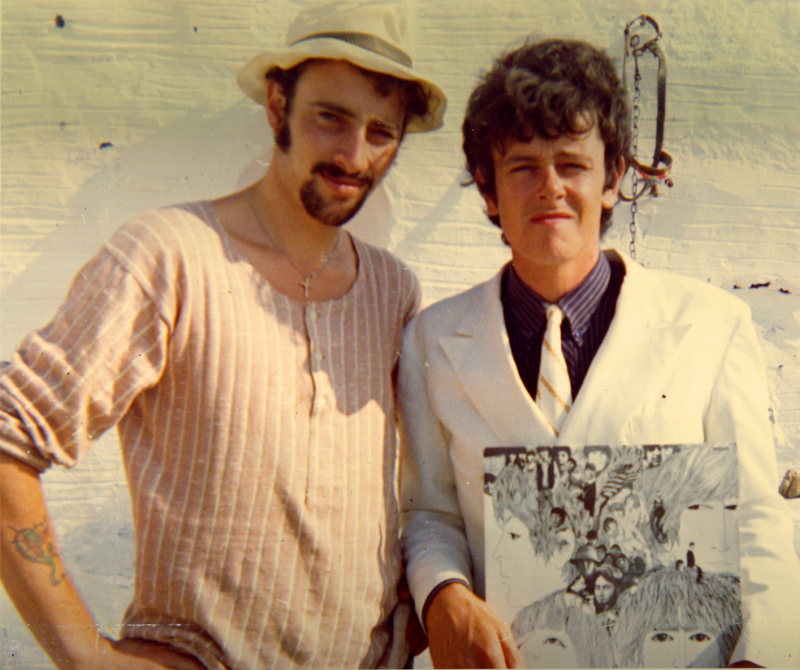 George Harrison said: “Donovan is all over The White Album”. It was natural when John asked to learn how to finger pick, he was a fast student and George wanted to know how to form my unusual chord patterns and Paul being left-handed couldn’t sit with John and I but Paul picked it up by ear. I didn’t know it at the time but I was leading them back to the roots. It was a pleasure to have been of service. You watched The Beatles recording “A Day in The Life” at Abbey Road. What do you remember the most of these sessions? The grand master George Martin producer conducting the most amazing session that had ever visited Abbey Road Studios. I strolled in and did my part. You recorded a lost version of “Laléna” with Marc Bolan (T. Rex). What really happened? Where is the tape? It’s hiding in Munich I think, where we recorded it. Marc and I did an electric version. Others have done similar. Deep Purple did “Laléna” (ed: on “Deep Purple” album -1969). Marc and I were friends and we used to play Battling Dinosaurs with his Japanese Tin Toys he brought back from his Japan Tour. The Dinosaurs puffed Talcum Powder and roared. He always beat me. I let him win though. How did it happen to record the “Billion Dollar Babies” single with Alice Cooper? I was recording “Cosmic Wheels” in 1972 in Morgan Studios. Alice was downstairs recording. We met I listened to what he was doing and he invited me to do a vocal. I realised I would need to climb above the Guitars that crowded the middle register so I went “Falsetto” which is what many singers do in bands like Led Zeppelin, YES and Deep Purple. I sang half the song with Alice and we made number one all over the world. What have you “discovered” through Transcendental Meditation? Sat Chit Ananda (ed: “being, consciousness, bliss” in Sanskrit). Can you tell us a few words about your good friend David Lynch? David is the master avante-garde artist who also makes films. A fully expressed human being, a deep heart diver into our inner world by the now available technique of Transcendental Meditation. Everyone should check out The David Lynch Foundation and David’s TV Channel. Nick Drake was a huge admirer of your music. Had you ever met him? Are you aware of his music? We met yet no words did we exchange. Nick was a fiery comet, too hot to last. I am often mentioned in relation to Nick Drake’s work. Did I know him? What are my memories of? I composed a poem to Nick. In the ‘60s and ‘70s you could listen to Donovan, Humble Pie or Procol Harum on the radio. Why today’s radio is so awful? There were fewer Radio Stations and great DJ’s who could play anything they liked. And they introduced so many new bands to us all. Like John Peel in UK and Alan Freed in USA. The Web promises freedom like this. Create your own Radio Station. Why don’t you all become DJ’s and play what you like..
Is there anyone you would like to play with and hasn’t happened yet? Jake Bugg… We are in touch but haven’t met yet.. I am writing to him now as I type this to you Thod. You have spent enough time in Greece. Would you like to send a message to your Greek fans? I am a great fan of all things Greek especially your Island Culture. Hello all my friends in Greece. “Agapi moo s’agapo poli” (ed: “My love, I love you very much” in Greek). 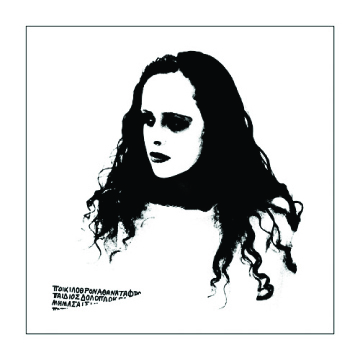 I also am a graphic artist and have created a series of Sapphographs …I call them so as they are photographic scenes influenced by the poems of Sappho. Poet to Poet. Here is one titled “Sappho” with a fragment of her poem. Available from popart@govindagallery.com . A huge “THANK YOU” to Mr Donovan Leitch for his time. Also, I would like to thank Angelique for her valuable help.